Here's an easy recipe for Frank's famous ribs that evokes Summer Barbeques, but simply bakes in your oven. We're pairing it with a crisp Rosé that cuts the spice and complements the sweetness of the sauce. Start with 2 full slabs of Baby Back Ribs. Remove the thin membrane from the back. (Grab one end with a paper towel and just pull. The membrane should come off in a single sheet.). Rub liberally and thoroughly with your favorite spice rub. 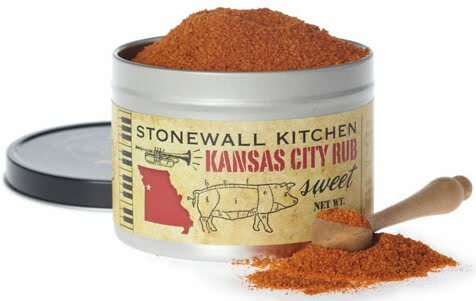 We use Stonewall Kitchens Kansas City Rub. Let sit in the refrigerator for 2 -4 hours. Meanwhile thinly slice 2 yellow onions. Spread on the bottom of a sheet pan. Preheat oven to 225°. Remove ribs from refrigerator and place on top of bed of onions. Cover tightly with foil and place in oven. Bake for 4 hours. Remove from oven. Remove rib s from pan and set aside. Drain juices and onions into the bowl of a VitaMix or Food Processor. Put ribs back into pan, covered and set aside. Increase oven temperature to 350°. Add your choice of hot sauce to taste. Uncover ribs, brush liberally with sauce and place uncovered in 350° oven for 20 minutes. Remove from oven and serve with remaining sauce on the side. If you're in a hurry, feel free to use your own bottled sauce. Always look for a sauce with natural ingredients. One of the best is Julie Johnson's "¿Porque No?". A cofounder of Frog’s Leap winery, Johnson started her Tres Sabores label several years ago using Zinfandel grapes from her ranch. But just as she was starting out, the warehouse in which she stored her bottles burned to the ground. She lost everything: more than 2,000 cases of wine. After the fire, Johnson sat among her ruined bottles, crying as she drank. Then she had an idea: Recycle the superheated wine as barbecue sauce! She called her creation "¿Porque No?" The sauce is a zesty blend of ingredients with fruity notes from pomegranates, persimmons, cherries and Meyer lemons. It also has a tantalizing smokiness - not just from the fire wine (there is almost three-fourths of a bottle of Zinfandel in each bottle of sauce), but from Washington State sea salt that has been smoked over Chardonnay barrels. The ribs pair wonderfully with a crisp Rose'. Our pick is from Robert Oatley. Robert Oatley Rosé of Sangiovese is a distinctively bright, modern style – dry and a little savory, with mouth-filling red fruit flavors and a crisp refreshing finish. However, if you've decided to try Julie Johnson's "¿Porque No?" then by all means try her Zinfandel as well!